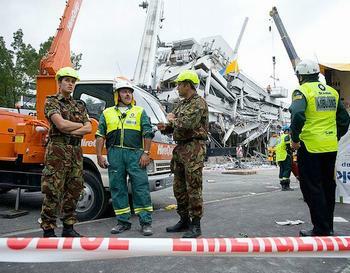 WELLINGTON, New Zealand, February 28, 2011 (ENS) – The official death toll in the Christchurch earthquake has now risen to 154 and is expected to increase further. There have been 70 people rescued alive. There are more than 240 people reported missing and unaccounted for in the worst-damaged sites in the city. Police say this number will include many, or all, of the fatalities. The identity of eight of the deceased has been publicly released. The entire nation will pause at 12:51 pm March 1 local time to remember victims of the 6.3 magnitude quake that struck Christchurch exactly one week earlier 12.51pm on February 22. Christchurch Mayor Bob Parker says it will be a hard day not just for the city, but for the whole country. Parker says people in Christchurch should not head into the central city to observe the silence, but do it from their homes. “We’re in traffic chaos to be honest, and our roads are in really bad condition and they’re still lifelines,” said the mayor. In Wellington, a vigil will be held on the steps of parliament from 12.30 pm March 1, and two minutes’ silence will be observed at 12.51pm. The service will be attended by the Governor-General Sir Anand Satyanand and Lady Satyanand, Deputy Prime Minister Bill English, church and faith representatives, parliamentarians and members of the Diplomatic Corps. The vigil event will be open to the public to gather on the forecourt or grounds of parliament. In Christchurch, work to identify the victims continues with help from disaster victim identification teams from Thailand, Israel and Australia working alongside those from New Zealand. Police say they are grateful for all assistance received. There are now more than 170 people involved in this work. Aftershocks continue to rock the Christchurch area, with hundreds of quakes of magnitudes from 2.7 to 5.6 including 13 with magnitudes above 4.0. These lesser earthquakes make it dangerous to enter the Christchurch central business area and police have cordoned it off. Yet police say they are receiving increasing numbers of reports of people entering buildings which have been declared unsafe and bear a red sticker. Electricity provider Orion New Zealand says crews are likely to have restored power to 85 percent of customers in the Christchurch area by the end of the day Monday. The earthquake knocked out electricity to about 60 percent of area customers. 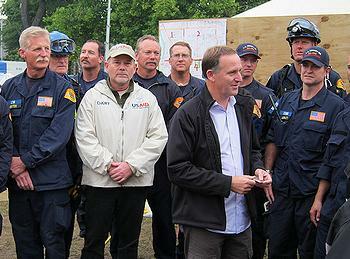 Prime Minister John Key Sunday launched the Christchurch Earthquake Appeal, a global fundraiser for the recovery effort in the city and the Canterbury region. Prime Minister Key today announced a six week assistance package to provide immediate support for Christchurch businesses and workers affected by the earthquake. An earthquake support subsidy is intended to help employers keep paying wages. And earthquake job loss coverage is available to support employees whose employer believes their business is no longer viable. “This package is a first step to help the people of Christchurch rebuild their lives and livelihoods. It is designed to get people through the next six weeks, as the government considers what measures will be needed in the medium-term,” Key said today. Claims for damage to residential buildings, land and contents can be lodged by telephoning the Earthquake Commission at: 0800 DAMAGE (0800 326 243) or online here. Claimants have up to three months from the date of the event to lodge a claim.